Skywatching satellite sleuth, Thierry Legault, has captured impressive imagery of the wayward Russian Phobos-Grunt Mars probe. A veteran skywatcher has snapped an amazing video of Russia's failed Mars probe as the craft heads toward a destructive plunge into Earth's atmosphere this month. Satellite sleuth Thierry Legault captured the impressive video of the Phobos-Grunt Mars probe Jan. 1 from the Calern Plateau observatory above Nice in the French Riviera. Russia's Federal Space Agency launched the Phobos-Grunt probe in November, only to see it fail to depart for Mars shortly after reaching Earth orbit. It has been stranded in orbit ever since. Legault reported on his website that his new video shows no sign of the spacecraft tumbling. "The unexpected thing that I realized when I looked carefully at the video is that Phobos-Grunt is moving backwards," Legault said, "with its solar panels deployed but at the opposite of the sun. It's not surprising that it had no energy to communicate!" 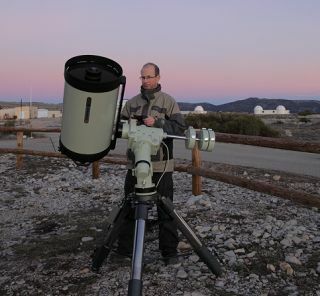 Legault's observation spurred Ted Molczan of Toronto, a leader in the amateur satellite- spotting network, to study the spacecraft's orientation. Shuttlecocks are roughly conical, consisting of a heavy mass at the tip (called the cork) and trailing feathers forming the cone. This configuration results in highly stable flight through the air, with the heavy end leading, Molczan noted. Molczan said that most of Phobos-Grunt's massive 14-ton bulk consists of fuel, located in tanks in the main propulsion module at one end of the spacecraft, similar to the heavy cork of a shuttlecock. "Although Phobos-Grunt does not have feathers, it does have solar arrays, mounted on the end opposite the fuel tanks, which may produce a similar effect," Molczan said. "An essential requirement for shuttlecock flight is the presence of air, of which there is exceedingly little in space; however, at the very low altitude of Phobos-Grunt, the combination of atmospheric density and high orbital velocity is sufficient for aerodynamics to dominate the forces affecting the orientation of a spacecraft." The failed Russian mission to one of Mars' small moons was captured by Thierry Legault and Emmanuel Rietsch (http://legault.perso.sfr.fr) on video, New Year's Day 2012. Phobos-Grunt launched into space early Nov. 9 (Nov. 8 in the United States) and was intended to land on Phobos, one of two moons circling Mars. The spacecraft was designed to snare samples of Phobos' surface and rocket the specimens back to Earth in 2014. But the Mars probe failed to boost itself out of Earth orbit on an interplanetary trajectory. Russian engineers have been unable to re-establish control of or contact with the spacecraft. There is a convergence of tracking predictions that places Phobos-Grunt's uncontrolled fall into Earth's atmosphere in the Jan. 15-16 time period. "That's about what we have as well … but there are uncertainties of several days still," said Holger Krag, deputy head of the European Space Agency's Space Debris Office, at the European Space Operations Center in Darmstadt, Germany. As for media reports of the disabled spacecraft crashing into any specific place, Krag said, "This is, of course, nonsense. It can come down at any place." Krag told SPACE.com that because our planet is covered by about 73 percent water, "there is a rather small chance that there would be a land impact." That being the case, the message from Krag for ground-dwellers is clear-cut. "Relax," Krag said. "The likelihood of somebody being hit is enormously low. It is way smaller than to be struck by lightning. If you have a thunderstorm above your city you would also not worry too much." When compared with last year's uncontrolled re-entry of NASA's defunct Upper Atmosphere Research Satellite on Sept. 24, followed by the downfall of Germany’s dead Roentgen Satellite (ROSAT) on Oct. 23, Russia's Phobos-Grunt is a special beast. According to the Federal Space Agency (also known as Roscosmos), the Mars probe is filled with tons of hydrazine and nitrogen tetroxide. All that fuel is stored in the probe's propellant tanks, which are reportedly made of aluminum. It is not clear whether or not the huge quantity of fuel onboard the marooned Mars craft is in frozen or liquid form. "It depends on how the tanks are built … how much volume the tanks have. This is very hard to say," Krag noted. The expectation is that the onboard propellant will be released and burn up at high altitude as the craft’s fuel tanks break apart during re-entry, he said. While the re-entry event will be a spectacular light show, "you'd have to be really lucky to see it," Krag added. "I would think that the chance of somebody seeing it is very low. If one does see it, it'll look like every other re-entry," he said. "Fragments would be falling off from time to time. But in addition to this, you might see little explosions now and then, making it brighter for a few microseconds and then relieving a few more fragments." The most likely Phobos-Grunt component to survive the fiery plunge to Earth is the probe's descent space vehicle — a sample-return capsule outfitted with a thermal protection coating. If all had gone well with the Mars mission, that nose-cone-looking hardware was designed to beat the heat of re-entry, then make a hard landing without a parachute in the Sary Shagan missile test range in Kazakhstan. The Phobos-Grunt re-entry is a new test target for the Inter-Agency Space Debris Coordination Committee, Krag confirmed. The committee (IADC for short) is an intergovernmental agency that coordinates research related to orbital debris in space, as well as man-made objects that re-enter the atmosphere. Since 1998, the IADC has performed re-entry prediction tests. Data-sharing between countries has helped sharpen skills for calculating the re-entries of spacecraft, rocket stages, even hardware discarded from the International Space Station. "This object will be followed by the IADC. It is a test object of this year," Krag said. A number of agencies will take part, he added, with European, U.S. and Russian sensors providing coverage of the Phobos-Grunt fall from space. "We can possibly do a prediction just right before it re-enters … good, timely coverage of the re-entry event," Krag said.